Things are looking up for a rescue dog that went away for training and came back with burns, wounds, and scars. LAS VEGAS (KTNV) — Things are looking up for a rescue dog that went away for training and came back with burns, wounds, and scars. 13 Investigates first exposed this training trauma in January . Now, Chief Investigator Darcy Spears shows what a difference a few months can make! "What's changed since we last spoke?" Darcy Spears asked dog owner Annette Mansfield. "My life!" Annette answered, laughing. "It has been a whirlwind of positive reinforcement." To appreciate the positive, we have to revisit the negatives Annette experienced when she sent her dog, Oreo, for obedience training. Oreo was a rambunctious rescue dog who'd lived on the streets before Annette and her son, Austin, adopted him. She hired Sit Means Sit Trainer Billy Salcido and spent nearly $2,000 for immersive training -- meaning Oreo would live and train for a week at Salcido's home. "He said, 'When I bring him back to you, you're not even going to know who this dog is. There's going to be so much difference in him' and this and that. The only difference was, besides the bruises, he lost what we originally trained him to do," Annette explained. When Salcido returned Oreo, he had wounds on his neck from a shock collar and other unexplained injuries. "I don't know who can do that! I don't know how anybody can do that," Annette said. "It shouldn't happen to another animal. It's just incredibly sad." As a result of our investigation Sit Means Sit fired Salcido, pulled his franchise license and refunded the Mansfield family $2,400 for the training and vet bills. "He lost his license. He can't hurt another animal. That was the most important thing to me--that nobody else has to go through what I went through," Annette said. 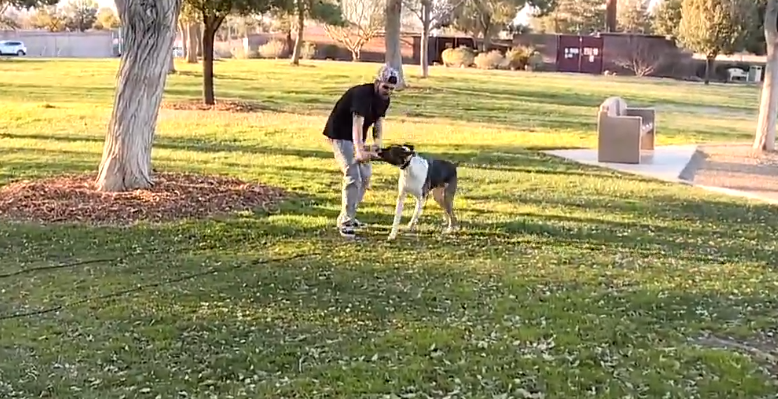 But she and Austin were still left to deal with a traumatized dog. "He wasn't listening. It was worse. If you raised your voice he would cower. I mean, it was a different dog but in a negative way. So it was horrible." And that's where Antonio Diaz comes in. "I just felt really inclined to help Annette," said Diaz, whose business, Leader of the Pack, specializes in working with rescues and rescue dogs. He says what happened to Oreo is awful, but sadly, "I don't think it's very unusual. I think, unfortunately, there are a lot of trainers out there who are not doing the right thing. And unfortunately this is a non-regulated industry." He reached out to Annette after seeing our story and has been working with Oreo, free of charge, ever since. "Between the interaction with him and Oreo you see that he trusted him, which made me trust," said Annette. Watching a training session, we could see how Oreo adores Antonio--giving him kisses and executing his commands without hesitation. Instead of shock collars and cages, Diaz uses positive reinforcement that works with Oreo's personality. "Oreo is a really hyperactive dog and he's really toy-motivated," Diaz observed, "so we use that as part of our training to build a relationship and to get what we want from Oreo by giving him what he needs." As a result, "I've got my home back. I've got my sanity back," said Annette. And her family got the pet they'd always hoped for. "Just happy again. Just very happy again," said Annette. "I have no words. It's been wonderful."